Make the vinaigrette: whisk together all of the ingredients except the olive oil – slowly add the oil, whisking constantly to emulsify. Taste the test the flavor, adding more of any ingredient to your liking; set aside. 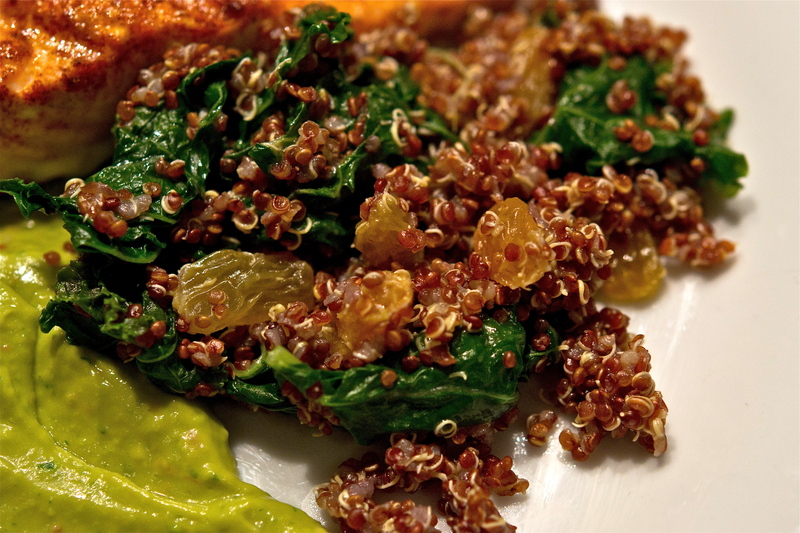 Prepare the quinoa: stir together the quinoa with 2 cups of water – bring to a boil over high heat. Once boiling, reduce the heat to a simmer. Cover and allow to cook for about 8 minutes. Add the kale and golden raisins, and return the lid to the pan – allow to cook for an additional 2 to 3 minutes (or until all of the water has evaporated). Slowly add the vinaigrette, and stir to combine. Serve immediately.